Types of grass that grow in the prairie are tough. The plants have survived prairie fires only to come back even stronger. They have been grazed by large and small animals, both wild and domesticated, and still continue to grow. Prairie grasses are an important element in a wildflower garden, shade loving varieties can grow under tall trees, filling in big empty spots in a garden. Varieties that like a wet soil do well planted by a garden pond or stream. Gardeners with limited space can plant them in containers to liven up a patio. 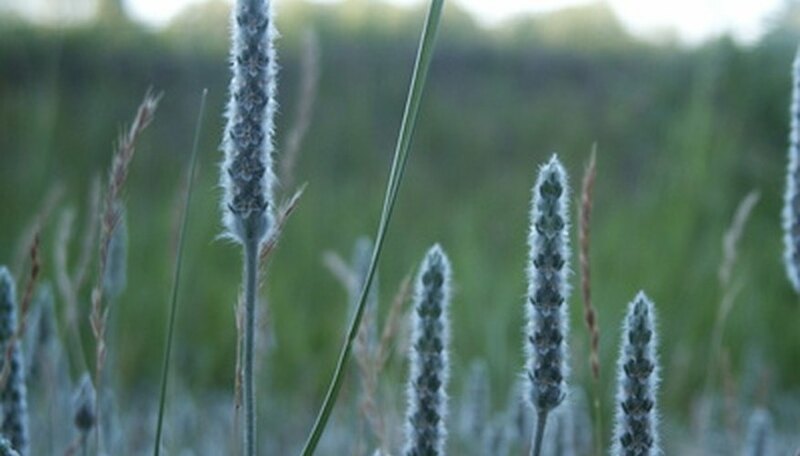 Yellow Indian grass (Sorghastrum nutans) grows from 3 to 8 feet tall and produces broad blue-green blades that turn orange or purple in the fall; yellow flowers that bloom in August, September and October and long brown seed heads. Yellow Indian grass is a favorite food of livestock. The plants' native habitat is the prairies and open woods from Quebec and Maine west to Manitoba and as far south as Florida in the east and Arizona in the west. The grass is also found in Mexico. Plant yellow Indian grass in full sun, partial shade or full shade and in a soil that is dry to moist. Yellow Indian grass is best used in a wildflower garden and will attract butterflies. Prairie brome (Bromus kalmii) grows from 2 to 3 feet tall and produces a drooping seedhead with very few yellow or green flowers that bloom in June, July and August and resemble stalks of wheat. The plant’s native habitat ranges from Maine to Minnesota and South Dakota and as far south as Maryland and Iowa. Plant prairie brome in full sun and day, sandy soil. Vanilla grass (Hierochloe odorata) is also known as sweetgrass. The plant grows from 12 to 20 inches tall and produces gray-green blades, yellow flowers that bloom in June and small, bronze seed-heads. The natural habitat of vanilla grass is meadows and along the shores across Canada and Maryland, Kentucky, Iowa, South Dakota , Arizona and Oregon. Plant vanilla grass in full sun and in moist or wet soil. Blue grama (Bouteloua gracilis) grows from 12 to 14 inches tall. The plant produces thin gray-green leaves and blue-green seedheads that extend outward from the stem, perpendicular to the ground. Yellow flowers appear in July and last until October. Blue grama grows naturally in the dry prairies and plains of southern Canada to southern Mexico and in the mid-west south to Texas. Plant blue grama in full sun and dry sandy or clay soil. The grass works well in a wildflower garden, an accent plant or as a turf grass. It is a favorite food source for birds and butterflies.